Upserve HQ helps you get the right message in front of your ideal guests at the perfect moment. Whether it’s giving the VIP treatment to your most loyal customers, creating profitable marketing campaigns, or managing your online reputation, Upserve helps you maximize your restaurant marketing plans and grow your business the smart way. Weekday specials, theme parties, holiday parties, game day specials – all of these restaurant marketing campaigns keep seats full and increase sales – at least in theory. But how do you know for sure? You know that marketing campaigns help grow your business, but it’s hard to measure which ones boost your ROI, and which aren’t worth the extra money, time, and staff payroll hours. Upserve Campaigns also helps you determine if the ROI for a past event was worth the effort, so you that can make smarter restaurant marketing plans in the future. Enter the dates of an event into Upserve Campaigns to see if your campaign brought in more guests compared to the same dates in the past. 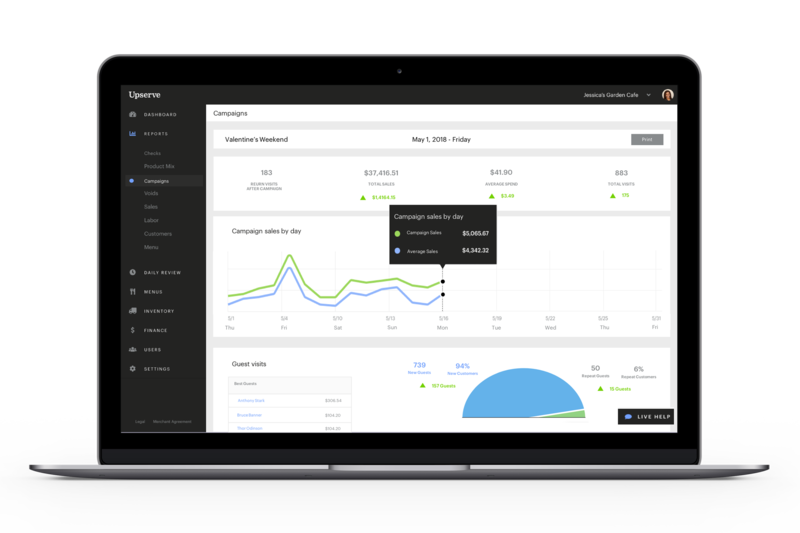 Track the ROI of a specific campaign or event by analyzing what your target customers spent money on, and how many new customers turned into repeat guests as a result of your efforts. The more you know about your guests, the more you can customize their experience and entice them to return. 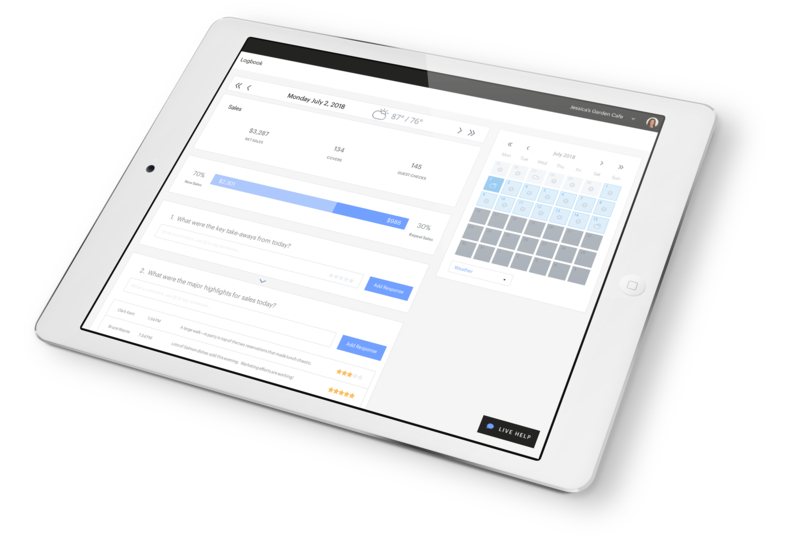 Upserve HQ includes software that’s a deep, integrative restaurant CRM that makes it easy to keep your customers coming back for more. Guest Book allows you to build unique customer profiles of your guests’ favorite dishes, their visit history, their preferred locations, and their typical spend; allowing any member of your staff to deliver targeted upsells and a personal touch to your repeat guests – even if they’ve just met. Spot ordering trends by drilling down on guests who come in for breakfast, lunch, or dinner and order a specific menu item. Ensure your staff knows your top customers’ favorite menu items inside and out. Pair servers with guests who’ve tipped them well in the past. Set custom benchmarks based on your “best customer” profile to identify new guests that could provide future value. Wondering if those weekly Margarita Mondays are helping or hurting your bottom line? Puzzled over how many guests are actually responding to your ongoing email marketing efforts? The Campaigns feature in Upserve HQ will not only track the sales, number of visits, and average check size for ongoing promotions, it will also show you how many new customers you attract and how many of those customers come back for a repeat visit outside of the promotion. You can also track online reviews from social media and review sites regarding your campaign, including Yelp, OpenTable, Google Plus, Twitter and Facebook, so you have the full picture of what impact your special event had on your customers. It’s important to keep your finger on the pulse of what’s being said online about your business. But it takes a lot of time to comb through multiple sites to manage your online reputation – and more reviews pour in each day. 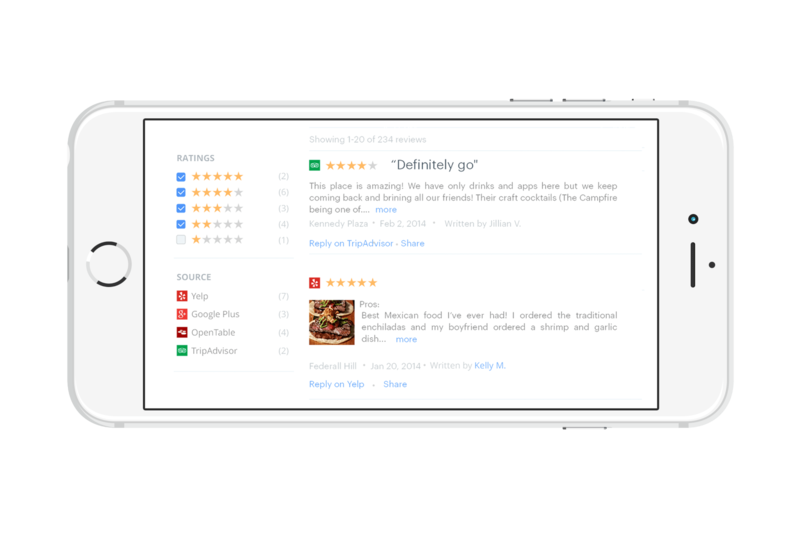 The Reviews feature in Upserve HQ scours the web and combines all of your restaurant’s online reviews from Yelp, Google+, OpenTable, and TripAdvisor in one place, so you can spend less time tracking down reviews, and more time crafting thoughtful responses. You can even track online reviews for up to 5 other restaurants to see how you stack up against your competitors, understand their vulnerabilities, and adjust your marketing efforts to highlight areas where you shine. Upserve digests the meaning of every review, spotlights every menu item mentioned, and shows you which dish is most loved – or not – so you can make smarter hospitality decisions. Was the steak undercooked in every review this week? Were drinks slow to hit the table? Perhaps you’ve got new staff in your kitchen or at the bar. 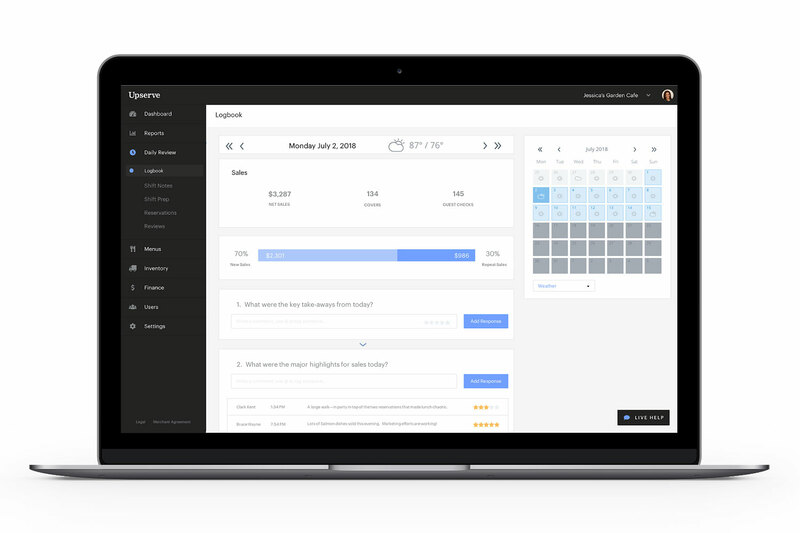 Upserve Reviews lets you pinpoint key themes that emerge across all of the review sites so that you can quickly take control and make improvements right now, where it matters most.